In a pressure cooker add the rice, milk and water. Then pressure cook for 3 to 4 whistles. Remove the pressure cooker from the oven and let it cool. Once it has cooled down, remove the lid from the cooker and mash the cooked rice. Add kalkandu and cook it in low flame. (You can add the kalkandu as it is if it is small size, if it is bigger size, then powder it and add). Keep the flame on and stir and cook until the kalkandu blends well with the rice. Add a tablespoon of ghee and mix well. 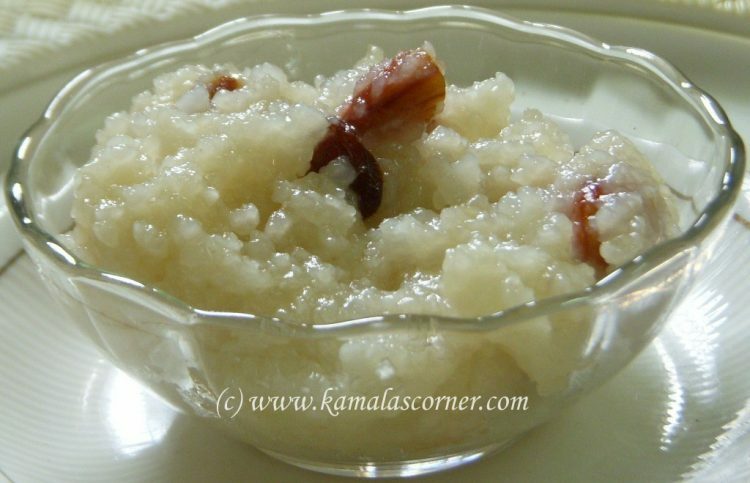 Fry cashew nuts and raisins in a tablespoon of ghee and add it to the pongal. Finally add the cardamom powder and mix it well and remove. Note: If you want less sweet, then reduce the quantity of Kalkandu to 3/4 cup. I tried out this recipe – Kalkandu Pongal – and it came out really well. My grandmother (an expert cook) just loved it and wanted to know the recipe. It is a honour to get appreciation from an expert cook, your grandma. Thank you for sharing your feed back. Hi madam Kamala, in case we do not have kalkandu at home, can we just use sugar? Would it give the same taste? Thank you. You can prepare it with sugar, but taste differs slightly. Is it okay if we substitute milk with coconut milk and kalkandam with jaggery?? The speciality of this dish is rice cooked in milk and kalkandu. If you add coconut milk, it will dominate the flavour of kankandu. Also if you add jaggery, it will become “Sarkarai Pongal”. If you want to use coconut milk and jaggery, you can try “Sarkarai Pongal” recipe.